There is treasure in your trial: Video Blog and notes. There is Treasure in Your Trial. Notes from video blog. Please view our first video blog and then check out the notes below. “And [pray] also for me, that [freedom of] utterance may be given me, that I may open my mouth to proclaim boldly the mystery of the good news (the Gospel), For which I am an ambassador in a coupling chain [in prison. Pray] that I may declare it boldly and courageously, as I ought to do. 21Now that you may know how I am and what I am doing, Tychicus, the beloved brother and faithful minister in the Lord [and His service], will tell you everything. Ephesians 6:19-21(AMP). The Ephesians must have asked Paul “how are you, and how are you doing.” His answer is a treasure map. Here is a formula for success in a brutal environment. 1. What you are is infinitely more important than how you are. “I am an AMBASSADOR in chains.” I have the unspeakable honor of being the official representative of a Kingdom. I am a royal, political and military prisoner.” It is not ease and comfort that make life bearable and it is not trials and tribulations that make life unbearable. My identity in Christ is more real than anything else. 2. What you are doing is infinitely more important than how you are doing. You have a daily defining moment. Every day, you must impose your mission on your circumstances. The life that knows it is here on purpose, and for a destiny is unstoppable. 3. Find your voice. “And [pray] also for me, that [freedom of] utterance may be given me.” He did not ask for freedom from jail but for freedom and boldness to open his mouth in jail. You may wish you were free, but God has placed you there for miracles. When Paul said, “For our light affliction, which is but for a moment, is working for us a far more exceeding and eternal weight of glory”, He had no idea how right he was! No doubt Satan was elated to see Paul neutralized in jail. However, elation turned to horror. Paul would start writing. More than half of the New Testament came from Paul’s pen and how can you calculate the wreckage to Lucifer from those writings? Lift up holy hands and begin to rejoice right where you are. There is treasure in your trial! First read this account by Todd Starnes. Rick Tuttle, the journalism advisor for Sutter Union High School in California, was among several thousand people in the audience. He said they thought the speech was one thing – but it turned into something else. Now here is what we are going to do about it. We are Mario Murillo Ministries. We are but one small voice in a galaxy of Christian voices. We cannot tell other ministries what to do. We must answer to God for the time that we have on this earth. 1. No one has the luxury of thinking that the war on Christianity is still in the closet. This outs it once and for all. Moreover, it has taken an especially ugly turn: They are persecuting our children through the educational system! They are now verbally abusing, and with breathe-taking hypocrisy, unleashing the worst kind of mass bullying in the name of an anti bullying campaign. When I heard Mr. Savage’s tirade I was stunned by how tired and stale his arguments are against the Faith. In my head, I could hear, “dude, is this all you got?” I have heard all of this drivel before. His bigotry fuels his intellectual dishonesty. His accusations about slavery and the Bible and especially Old Testament law would be pathetically hilarious, if it were not for the fact that Obama, among others, has given him a vast stage to spew his poison. To the thousands of pastors who are still squeamish about facing this onslaught, I say with a humble heart that you must pray and speak out. It will be at your doorstep. You can either go out and face Goliath or wait till he is breathing down your neck and abuses the law against your ministry. You may assume that we are to be sweet about this but the Bible and history teaches us a clear lesson…silence is deadly. You cannot leave your youth unprepared and untrained in understanding their faith. We must give an answer! 2. The battle is not yours it is God’s. Yet, in all of this, Mr. Savage remains a soul for whom Jesus died. Paul understood that we have to return fire with the weapons of the Spirit which are not carnal but mighty through God to the tearing down of strongholds. It is easy to stage a humanly driven holy war instead of contending for revival. God wants to give us a divine response to this Christophobic onslaught. In Luke 21:15 Jesus promised, “I will give you a mouth and wisdom which all your adversaries will not be able to contradict or resist.” He will give us the unction but we must give Him our mouth! 3. How do you feel about this Mr. Obama? Let every Christian soul look to the White House for a reaction to this religious bigotry. If Obama does not disavow this flagrant an assault on the faith how can you vote for him? No, that is not a rhetorical question, I really would love to know. Victory and Effectiveness Part Two: Getting things done. Now that we have taken care of the inside lets go to work on the outside. We must learn the discipline of getting things done. Inner victory must become action or it is useless. According to Stephen Covey effectiveness is doing the right things and is much more important than efficiency (doing things right). A simple example of this is in football. A team might be very efficient in running plays but they will not be effective unless they call the right play. For a true child of God, effectiveness is way beyond doing the right things; it is doing what you were born to do. Eighty nine percent of all Americans believe they were born for a purpose but only twelve percent believe they have found that purpose. A whopping seventy seven percent of all of us walk around in a quandary. We know we were born for something but we do not know what it is! This is why The Purpose Driven Life has sold millions of copies. Many who have read it are still frustrated. You cannot initially come to God because you want purpose. You must first come to God because you realize that you are lost, condemned and that Christ died for you on the Cross. Jesus was purpose driven. 1 John 3:8 says, “For this purpose was the Son of Man manifested, that He might destroy the works of the Christ’ passion and purpose drove Him to action. That is why the devil cannot be left out of our consciousness. If we are a part of Christ His purpose is in us. We too must destroy the works of the devil. If you buck this truth, you will delay your destiny. Mario, how can I know what I am supposed to do? The answer you expect from me is “pray and God will show you”. I will not argue with this but I have another answer you may not be ready to hear… If your heart is right, the answer is another question, what you want to do? What is in your heart to do? Your passion will reveal your purpose! This is how God gets the best out of us! The secret to getting things done is to understand the primary reasons that we do not get things done. We do not do things because we do not want to do them. We stop doing things because we get resistance and it is not worth it to us. We do not get things done because we secretly sense that this is not what we are supposed to be doing. This all sounds obvious but we are not always aware that our heart is not in something. A sense of duty, obligation or guilt is poor fuel for getting things done. Another big reason that we do not get things done is that Satan holds off until we are ready to act. He ignores our planning sessions and pep talks because he knows how easily we confuse good intentions with actually doing something. He amasses all of his resources to attack at that moment when we try to get it done. When you are in a rut, you cannot see that you have conflicting forces sabotaging your best efforts. We run at our goals with all of our might but we cannot cross the finish line because we are spent by the time we get there. We have layered our outward projects over a heart in conflict with those projects. Until your actions come from the core of your being, you will not get it done. The person with inner victory and a passion for their destiny is the complete opposite. Their energy increases when they take action, action is inevitable. After all, how can you stop someone who, with all of their heart is doing what they were born to do? It is a happy day when we learn to become armed and dangerous before crisis hits. 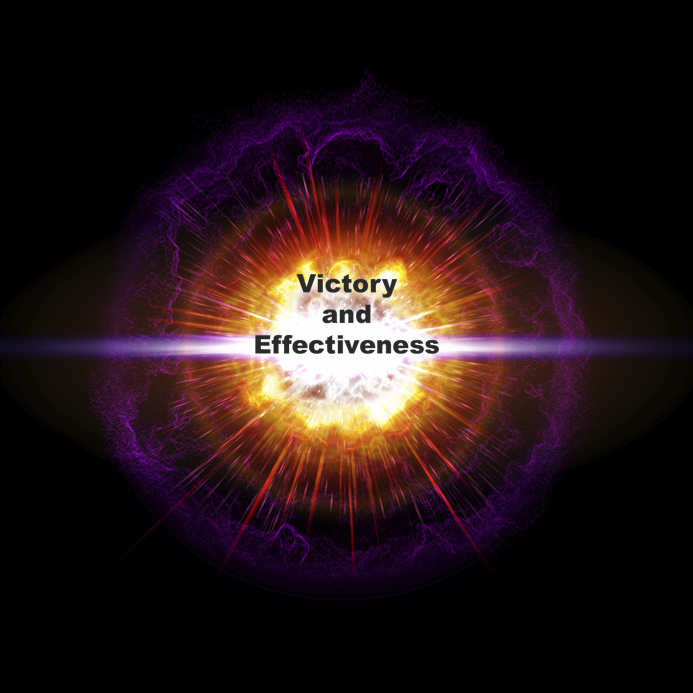 It is an even happier day when we learn the secret of victory and effectiveness! If I wanted to get a wider audience I probably should have entitled this Winning and getting things done.” However, I am not looking for the wider audience, I want the right audience. Solomon said that wisdom cries out and offers itself to all men. Wisdom calls to us and bids us live a life of power and abundance regardless of the times. To get to this wisdom we have to get over ourselves. It is our flesh that hates to be stretched or challenged. This is why we usually settle for only as much victory as it takes to get by. It is when disaster strikes that we find out our true condition. It is a happy day when we learn to become armed and dangerous before crisis hits. It is an even happier day when we learn the secret of victory and effectiveness! Let’s start with victory: I say this as gently as possible: Most of what is presented today as “Christian living” is not true victory. It is a dangerous counterfeit. We need to look where John is pointing, “This is the victory that overcomes the world” 1 John 5:4. Let us start by defining victory. Forget what the world calls victory. Set aside your own definition and let God define victory. “We are more than conquerors through Him that loved us” This phrase is the most succinct definition our true victory. “More than conquering,” means winning the battle in front of you and the wars yet to come. Ancient Israel multiplied the number of wars she had to face because of détente. Each time thatIsraelsettled for an alliance instead of victory, she invited terror in her midst. Détente in the life of a believer is peaceful coexistence with Satan. No matter how eloquent your teacher/Guru is, they cannot change the reality of war. You see detente in their teaching when they diminish or deny the existence of the devil. Détente says you can serve two masters, but in all such amalgamations, evil has the upper hand. Détente permits you to quarantine your sin and destructive habits instead of abolishing them. Détente is a nervous pact with darkness. This pact lets you look spiritual while still in the pocket of evil. Entrenchment means to dig in and secure the camp. It is a well-guarded perimeter. You have taken ground and you are never going to give it back! Jesus said, “Satan is coming and He has nothing in me.” –John 14:30. Their loyalty to God was unconditional. This nomatterwhatness tells the enemy of your soul that you are beyond defeat making it futile for the devil to attack you. Tomorrow: Get things done. It had to happen. It was inevitable. It was inevitable. It had to happen. Last night will always be remembered as the night that the lady began to scream “my eye is good, my eye is good!” Her miracle is still echoing off the walls of the Dream House. From the jump, you knew this would be a historic night. The first note of worship that came out of Eddie Zepeda’s mouth brought the glory of God into the Dream House. I was nervous about this meeting because of the postcard. This ministry mailed out a postcard that read “the fire that fell on Clearlake will fall on the Dream House.” For those of you that may not have been aware we spent 4 weeks in Clearlake harvesting souls. What happened while we were there has been chronicled in several posts at this site. The miracle in Clearlake is glorious and strategic. It is a timeless and classic example of revival. One great proof of this is after we left Clearlake the move kept going. If you have not read the reports scroll down after you read this blog and see for yourself. Anyway, I wondered, “how can we make good on a promise like that?” The saving grace of the postcard was the fact that the fire did fall last night. Did it ever! In retrospect, no other prediction would have made sense. The people of the Dream House sent us out to Clearlake. We went out with their prayers and their blessing. Even though they have been yearning for the breakthrough that God granted in Clearlake. 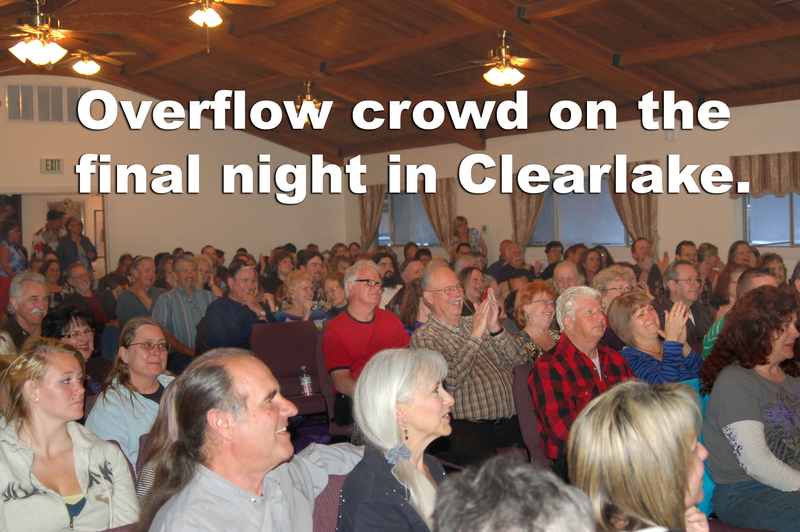 They sowed into Clearlake and last night they reaped a major return. Of the many glorious healings that happened last night there is one that stands out. God picked her out of the audience and revealed that she had, among other things, diabetes and hepatitis C. The Holy Spirit even detailed the struggle she faced in the last year. Now electric currents of God’s power ran to and fro in her body with healing. The next healing has a special place in my heart. A Pastor from the South Bay came to be encouraged. He had been deeply wounded in the ministry and had to have a word from God. He got way more than he bargained for. I asked him to lay his hand on his heart. “You have a heart condition and this is your healing!” Later that night, he met with me and sharing a horror story that is now all too common among pastors. Now he knew he could fight on and see revival in his church. I called our healing team to the front and the invited the sick to come and be healed. This is when the fire fell! Suddenly there were miracles popping all around us. I have never been so proud of our healing team in Martinez. They were bold and compassionate and waded in deeper to human need than ever. The most import result of last night was the salvation of souls! The momentum is here and the meetings at the Dream House are now unstoppable. Our Friday nights will never be the same! FYI: Tomorrow I am going to post an urgent message to pastors and leaders about Bethel Church in Redding. It will be posted at around noon West Coast time. 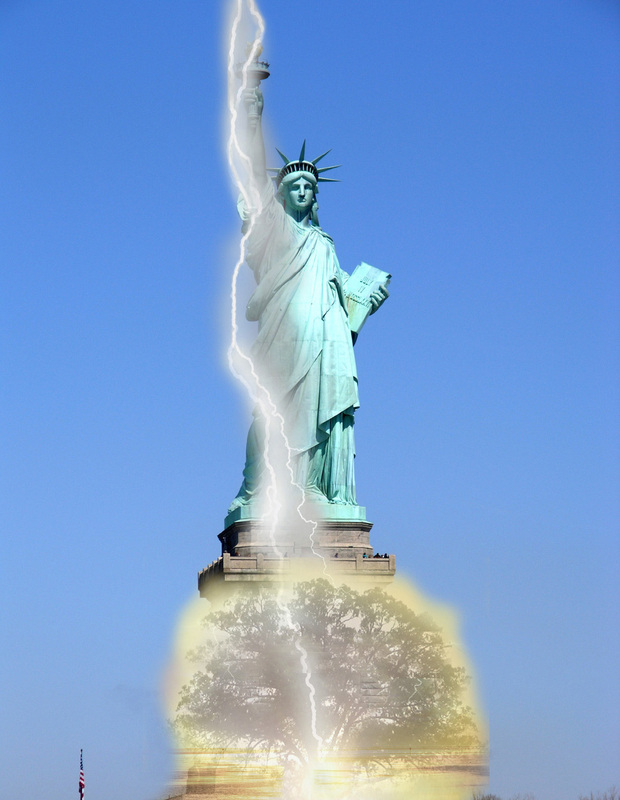 America Needs Another Burning Bush! America needs another burning bush. He was the greatest has been in history! He was a child of promise but when his time came he panicked, killed a man and ran for his life. He ran and just kept running. He outran his destiny. He ended up an 80 year old burned out shell tending sheep. The seeds of greatness were obliterated. He was, by all practical definitions, a walking dead man. We are about to see the worst decline of the church in our nation’s history if we do not take drastic action. If you cannot get fired up and into action you are going to leave a horrible world for your children and grandchildren and worst of all, you are sending them into it alone, unprepared and helpless. Islam is in and Christianity is out: As I reported to you before from sources that are the most reliable, radical Islam is recruiting an army of terrorists in our prisons and from our inner city gangs. The American immune system is down: The September 11 attack was not the judgment of God it was something that got through because our national immune system was down. Like Moses, the story of America is not one of human prowess. The Declaration of Independence, the Constitution and the Bill or Rights are not the well crafted documents of gifted men… they are miracles! – The rest of the world intuitively senses that we have abandoned our roots. They know that without God we are pathetic at best and dangerous at worst. False ministers thrive in America while many true ministers languish as burned out shells tending sheep! Again, why do we need to see the impossible condition of Moses? Because here we go again! Look around you; you will see an abundance of ministers who began with a destiny who are nothing now but burned out shells tending sheep! Where are they today; the men and women who began with fire, clear direction and unstoppable zeal? Some are outwardly successful but secretly dead. Some are drowning themselves in activities that are totally ineffective and have nothing to do with their original calling. Some are dying from diseases brought on by the stress of viciously fickle congregations. Some are so far gone that revival and awakening are now distant fantasies. Things look impossible and that is the point! There you have it; a nation gone crazy, a generation of believers gone their own way and an army of Godly vessels beaten senseless! Things look impossible and that is the point. It is out of this impossibility that Jehovah will work. What can we do? What do we need? The answer comes from Moses…we need another burning bush! This is the work of the Burning Bush. An ancient tabloid headline about Moses would read like this: Rest home reject rises to change the world! 2. The Burning Bush is a purifier: Exodus 4:6 Furthermore the LORD said to him, “Now put your hand in your bosom.” And he put his hand in his bosom, and when he took it out, behold, his hand was leprous, like snow. 7 And He said, “Put your hand in your bosom again.” So he put his hand in his bosom again, and drew it out of his bosom, and behold, it was restored like his other flesh. 3. The burning Bush is a model of strength- of not being used up- of running on fire that needs no fuel! Burn beyond discouragement, burn through lies, criticism and threats and cross the finish line mightily. What Happens Now? The closing service of the Clearlake revival. What happens now? This was the final night and a culmination of weeks of revival. Pastor Steve Snyder asked those who were healed to testify. Each testimony raised the level of power until it was overwhelming. Here is one story about a man named Joe. I called him out and he was healed of heart disease on the first week of the meeting. Right after he was healed the Holy Spirit told me to tell him that he would soon lay hands on a doctor and that doctor would be healed. Fast forward to today when he went to his doctor’s appointment. During the exam the doctor starts complaining about his spine. Joe says “I am going to lay hands on you.” When Joe did his hand got hot and power shot into the doctor’s back. The physician was healed! My final sermon was entitled Supernatural Living. I took Galatians 2:20 “I have been crucified with Christ; it is no longer I who live, but Christ lives in me; and the life which I now live in the flesh I live by faith in the Son of God, who loved me and gave Himself for me.” I told them that everyone has a before and after. This “after” that they now have is not going away. What happens now, I told them is that this move of God will get stronger! They will live by the faith of the Son of God! They have been bought with a price and they will live above the oppression around this lake! The anointing overcame me and I waded into the audience. The power of God struck 6 cancer victims. 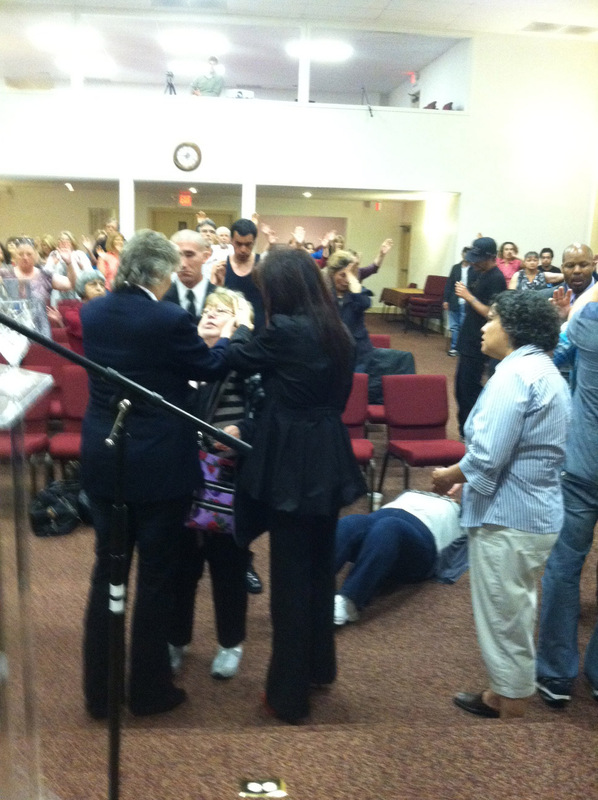 One poor lady was at death’s door but it was clear that resurrection power was overtaking her disease! The healings came in wave after wave. People broke out fear and began ministering to others. By the time that the anointing lifted two hours had evaporated. I asked for all who were healed to stand and well over a hundred people jumped to their feet to give God glory! Then I told the audience that I wanted them to remember that the last thing I did in this revival was to win souls. I shared the love of God and then made an appeal from the depths of my heart. Once again they came from everywhere to receive Jesus. All told, hundreds have been saved and healed and thousands have been impacted! What happens now? For the good people of Clearlake the move of God will take on new and deeper form. It will be a people’s movement that will grow in every church that will open their heart to God. What happens now for Mario Murillo Ministries? While it is true that we went to Clearlake and brought a change but we were also changed by Clearlake. We will never let go of this fire! I am ruined for ever having a “normal service” again. We cannot let go of the revival power of God that has gotten a hold of us! What happens now? 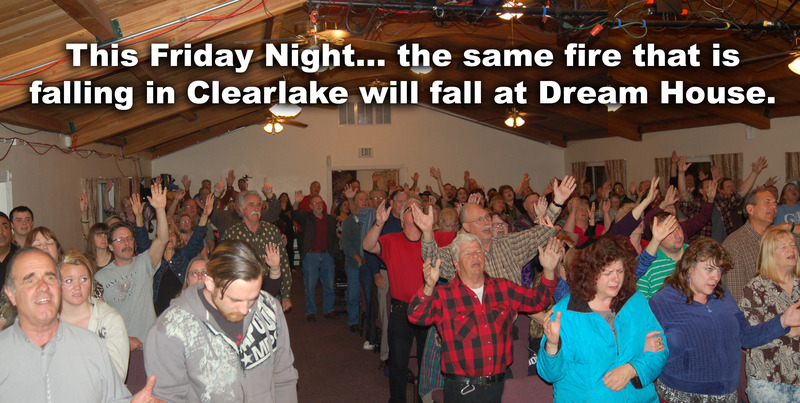 The fire of the revival in Clearlake will explode at the Dream House this Friday night. You will hear the amazing reports and testimonies that cannot fit in this blog. There will be an unforgettable worship experience led by Eddie Zepeda. I will bring a message of revival for our nation. We are trusting the Holy Spirit to move among us in undeniable power. Please join us for this mighty night of joy and power. For anyone within driving distance do not miss the chance to be in a meeting that will have all of the firepower of the meetings in Clearlake!